Justin’s note: As regular readers know, owning physical gold for the long term is one of our core recommendations here at Casey Research. It’s real money, a safe-haven asset, and a way to protect your wealth. Casey gold experts Dave Forest and E.B. Tucker both see gold prices ripping higher in 2019. And so do our friends over at Palm Beach Research Group. The January 14 Bloomberg headline above might not seem like much to you right away – but it immediately caught my attention. But that’s not the only reason the headline caught my attention. Mergers among mining companies are signaling a shift in the gold market, too. Regular readers know that we at The Palm Beach Daily recommend holding a small percentage (5-10%) of chaos hedges like gold in your portfolio. These assets provide insurance in times of crisis. But under the right conditions, they can also boost your wealth. In today’s essay, I’ll tell you why 2019 is shaping up to be a year in which holding gold will start to pay off. Did you see the big news? Jason Bodner is going public with a secret “stock-picking GPS” that can help sniff out explosive stock moves BEFORE THEY HAPPEN. Over the past six months, the gold mining industry has seen two megamergers. 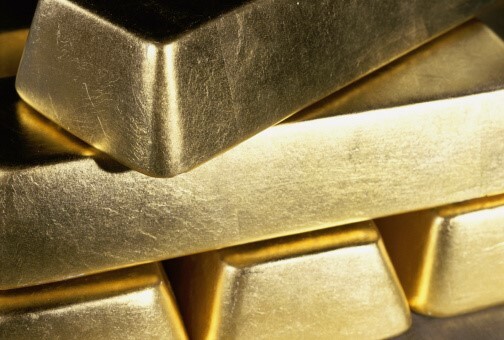 In September 2018, Barrick Gold bought competitor Randgold Resources for $6 billion. The merger made Barrick the largest gold mining company in the world… But that title won’t last long. Two weeks ago, Newmont Mining announced it would buy rival Goldcorp for $10 billion. If the deal goes through, Newmont will unseat Barrick as the world’s biggest gold miner. Both Barrick and Newmont Goldcorp still represent only six or seven percent of global mine supply, so it’s still a very fragmented industry and I think investors are rightfully demanding that there’s a bit more consolidation. And miners aren’t just merging because the industry is fragmented. They’re merging because it’s also necessary for their survival. That’s why the pressure is on for them to join forces. Due to lower prices, miners have had to tighten their budgets. And in tough times, one of the first budget items to go is exploration. After all, if gold isn’t profitable, why look for it? It hasn’t just been gold miners cutting back, either. Metals miners across the board have done so as well. Capital spending is projected to be less than half of what it was at its peak in 2012. 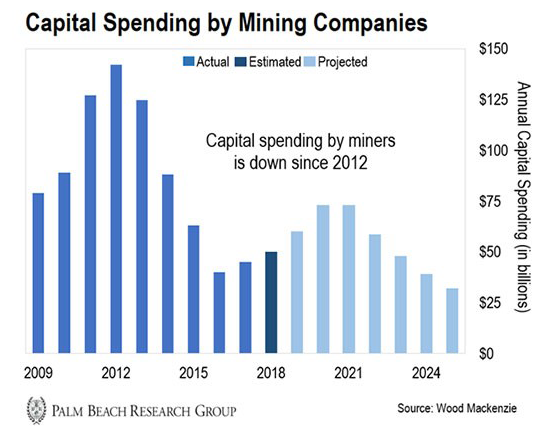 And smaller exploration budgets mean miners are finding fewer new deposits. On top of that, the new deposits aren’t as good as old ones. Cryptocurrencies have fallen… but the moment the biggest e-commerce company makes this shocking announcement, it will send shockwaves through the market. This could be your last chance to bank massive profits in the blockchain market without buying a single cryptocurrency… before prices run up like we expect. You’ll want to be on this profit train when Amazon makes the big announcement. He’d know… His company does the drilling for exploration teams. Adding to the supply crunch are production costs. Over the past 15 years, they’ve skyrocketed about 300% for major gold companies. For example, Barrick had an average production cost of $300 per ounce in 2004. Ten years later, it rose to $800. And Newmont’s production costs jumped from $278 per ounce in 2004 to $922 last year. It’s a common saying amongst commodity investors. When prices are low, miners aren’t making money. So they stop exploring new mines. The lack of supply creates scarcity. But scarcity eventually pushes prices back up. That’s why miners are merging. They’re desperate for profits and hoping they can make up for lower profitability by increasing scale. But that’s a short-term solution. Still, the long-term outlook for gold is positive. As gold becomes scarcer, prices will eventually rebound. Now, it could take a couple years for this trend to play out. But when it finally does, we’ll see gold rise over 50% and reach new all-time highs. The key is to get positioned now, before the move higher. 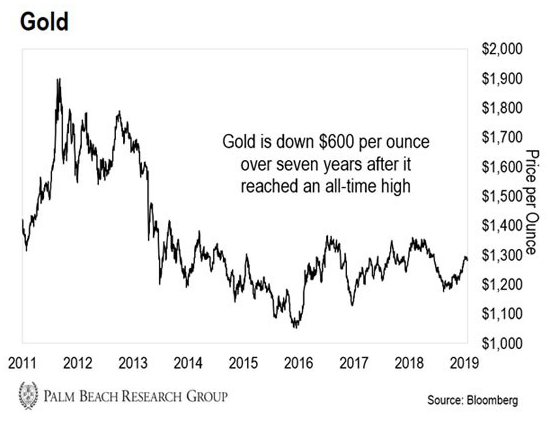 To capitalize on this trend, I recommend buying some physical gold… or shares of the SPDR Gold Shares ETF (GLD), which tracks the price of gold. Justin’s note: Of course, you’ll need to own the “best of breed” gold stocks to pocket the biggest gains during the next gold bull market. Unfortunately, most investors don’t know where to find those. They can’t tell the difference between a world-class miner and a crummy one. Doug is firing on all cylinders in this message. I am from Canada and I do not plan on banning Doug Casey from my country… though I concede our globalist, meme-following government might. I agree wholeheartedly with Doug. There is only the collective (of whatever the flavor of the day is), and the socialization of everything at the expense of individuals and individual freedoms. Keep up the good work. Perhaps a bit of provocation here and there will actually do some good. This is by far Casey at his best. I have read many articles, opinions, and books by Doug. In this essay, he articulates just how/why our culture has become so pathetic. Nothing he wrote is untrue. Nothing he wrote was offensive – at least in my mind. The world has lost its collective mind. It’s high time real men stand up and be heard. Refute the vitriol and nonsense when any opportunity arises. Listening to Doug Casey lecture on all subjects that matter should be required for college students. If they listen (a BIG if) we would eliminate the socialistic curriculum that governs just about all state funded institutions of “no longer higher education.” Doug is a thinker, an “objectivist” and can both write and verbally present his ideas with clarity, rational thought process and conclusions and recommendations that make sense. Sadly in this country of opportunity, there are so few like him, and worse, fewer coming into our society. I’m sure he wouldn’t subject himself to the self-sacrifice of public office and who could blame him, but he and people like him are sure needed in leadership roles while we still have the opportunity to correct the stupidity he so clearly identifies. Doug, the world needs more intellects of your caliber. Keep up the good work, I always enjoy reading about what you have to say. I just wish I lived in a world that appreciated and celebrated freedom in every form. Thank you for some reason in this strange world. A breath of fresh air! My response to Doug Casey would be “Doug, you could not be more right. Oops, can I say that?” I enjoyed the article very much. I totally agree and support Doug’s take on this cancerous ideology. The removal of the "masculine" male is at the head of societal collapse, not the opposite. No leader (not dictators) in family and marital relationships breeds weakness and uncertainty. This is the goal of globalists and liberal democrats, divide and conquer. Remove the bond of man/woman and the strength of "united" collapses. It seems to be working. Seeing corporations such as Gillette bowing to this influence is like getting a positive cancer diagnosis. We are in very deep trouble. I read the interview with Doug Casey on toxic masculinity and white privilege with much amusement. He’s “running scared” because he, and others like him, see that huge flock of their pigeons coming home to roost. As long as Mr. Casey and his ilk (rich, white males) were proudly sitting on top of the heap – Kings of the Hill – God was in his heaven, the White Man was in his rightful place, and all was right with the world as far as they were concerned. Now, after several hundred years of that bulls**t, the rest of humanity is finally getting fed up and demanding an end to the demagoguery of white men. As a 100% heterosexual male I regard the idea of “toxic masculinity” as something of a joke. Put the word “white” between “toxic” and “masculinity” and you hit the nail squarely on its head, however. White men have dominated Planet Earth through their ideals of white supremacy, unmitigated brutality, and the lavish and unrestrained use of their guns for the past thousand years, or so. To them, it’s a great system because they reap all of the benefits while crapping on the rest of humankind. At long last, the rest of us are fed up and we demand a reckoning. It’s the same reason that the wealthy elite have demonized Alexandria Ocasio-Cortez. As long as the rich were getting richer at the expense of everyone else, they were good with it. “No problems, here!” they said, looking down on the rest of us from their position on the top rung of the economic ladder. Ms. Ocasio-Cortez comes along, proposing a 70% tax on the wealthy, which strongly resonates with a majority of the American population, and the wealthy elite are s**tting their pants because they see a real possibility of having their ill-gotten wealth taken from them. Yes, Mr. Casey, America’s economic system is about to collapse and quite probably the American government and society with it. And, I agree with you on one point… It will probably be violent. You want to blame someone? Look in the mirror. I agree with Doug. Western civilization is being destroyed by socialist economics, and by the denigration of Western moral values. Western civilization is based upon the idea of the sovereign individual. The socialist and “politically correct” movements sacrifice individualism for tribalism. Tribes are led by chiefs that tell the tribe members how to think and behave. It is this tribalism which holds back the innovation needed to alleviate poverty. I had been ignoring the craziness of “politically correct.” However, when my son criticized me for championing free speech, I realized that by ignoring it, I have contributed to this malignancy. All those who cannot learn from the socialist dictators in Zimbabwe and Venezuela are bound to repeat here, what has happened there. This is a great article… I don’t like that it’s true… But I’m fine with men running my country, I have enough to do to care for my home. I’m a “housewife.” And happily so. Women have it pretty good. While some women are unfortunately forced into the workplace, if we don’t have to, lucky us. We women have, for the most part, the choice to do whatever we want to. Why do some women feel the need to ruin it? And as for socialism… wow, people, look around! Thank you for letting me put in my 2 cents. I actually could come up with a whole dollar! What were your thoughts on Doug’s latest interview? Share them with us right here: [email protected]. Are you ready for the coming crash? Master trader Jeff Clark believes the bull market has ended. The bear is here. Most investors will be wringing their hands. But smart traders have the opportunity to double their money again and again. 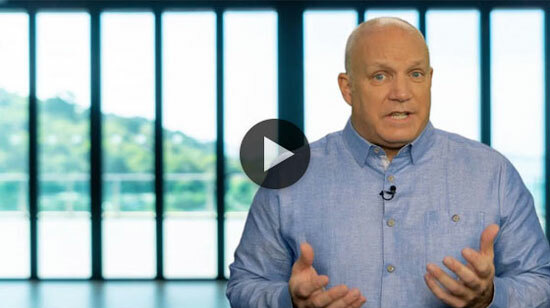 Jeff shares all the details in this urgent presentation.